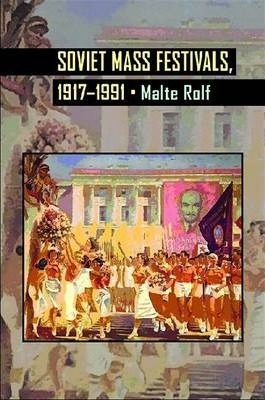 The overall story of Soviet celebrations moves from improvisation into standardization, although always marked by shortages, followed by a long period of repetition after World War II, with a growing divergence between public conformity and private diversity in the USSR’s final years. Public celebrations held a special place for the Bolsheviks because they came to power claiming to speak for the masses that the old order had repressed. Turning out large numbers of people for revolutionary celebrations thus illustrated the correctness of their claim and reinforced their power. At a time when Soviet power was explicitly set against remnants of the old regime, the Orthodox Church in particular, getting people to march in May Day events rather than in religious processions was another step in establishing the revolutionary order. Rolf documents the chaos and improvisation of the revolutionary days, when masses of people on the streets affected the course of events in Russia’s capitals. He shows how early Bolshevik celebrations sought to recreate this fervor, and he looks behind the scenes to show how organizers competed with one another to define what Bolshevik celebrations would look like in practice. In the beginning, anyone who called himself (and they were all men) a celebration expert and managed to get people organized could have a significant effect, although the people drawn to this work tended to be “theater directors and artists, popular pedagogues, and agitation functionaries.” (p. 37) People argued about whether the celebrations should serve to educate the populace or whether they should provide space for members of the proletariat to articulate their own visions of what the revolution should bring. Over time, the typical forms of Soviet celebration evolved into a recognizable if not entirely uniform practice. Democratic centralism turned out to be far more central than democratic, and the celebrations performed in Moscow came to be seen as the orthodox way of doing things. Partly this was the power of example, with national radio and newspapers reporting on how celebrations were performed in the capital. Partly this was the power of the purse, with resources from higher levels being made preferentially available to people who followed the models from headquarters. And partly it was ambition, with people who wanted to move up in the ranks showing their skill and zeal by following the party line set in the center. Coercion appears to have played a less prominent role than in other parts of Soviet life, although that is a relative notion, since any sort of deviation in the 1930s, particularly one as publicly visible as a mass celebration, was potentially fatal for the nonconformist. Rolf discusses how the Red Calendar of official Soviet occasions interacted with other aspects of public and economic life. As dedicating new buildings or laying cornerstones came to be a typical form of celebrating the anniversary of the October Revolution, construction schedules were set taking that day as a deadline. Production quotas, too, were set so that factories could announce positive results during the anniversary celebrations. Some Soviet leaders believed so strongly in the power of their calendar that they thought Hitler was making a particular effort to capture Moscow before the anniversary of the Bolshevik Revolution. Rolf devotes a full chapter (out of six in the book) to comparing Soviet practices to other contemporary societies. I am almost always glad when historians take the time to compare their subjects because it helps readers to see what is particular to the subject at hand versus what may be a more generalized trend. Rolf look particularly at Soviet practice as it compares with two other totalizing dictatorships of the interwar period, Fascist Italy and Nazi Germany. He also looks at a different kind of system and examines public celebrations in pre-WWII USA. The book’s last chapter considers celebrations in post-Soviet Russia. He finds that some holidays invented or pushed by the Soviets — Women’s Day on March 8, for example — have found continued acceptance among the general population have flourished even after the demise of the USSR. May Day and Victory Day are both still prominent, although official emphasis is now far more on the latter than the former. Anyone who has tried to do business with Russia in early May can attest that the coming of spring is marked by both official holidays and considerable additional time off from working. Soviet Mass Festivals, 1917–1991 is as much of a page-turner as its title suggests. But every now and then delving into the specialist literature is something that I enjoy. It shows me what the synthesizing works are drawing on, gives me a sense of what kinds of details researchers are looking into, and reminds me of the different levels of historical work. I almost certainly won’t come back to it, but I am glad that it’s out there.